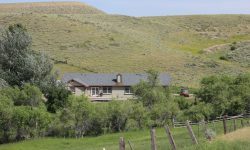 Timeless 27.52 +/- pastoral Acres on Weiser Creek, 15 miles southeast of Lander, WY, in the foothills of the Wind River Mountains. Two houses, detached garage with greenhouse and workshop. Approximately two acres of hay ground and additional dryland pasture. Adjacent to BLM (Bureau of Land Management) public lands on the west. Beautiful views of the rolling hills to the east. Main House is 2530 sq. ft. on one level with open kitchen, living and dining area, 3 BR/3 BA, and an office. An additional house, 1276 sq. ft., c. 1949, is in need of repairs but would make a wonderful Guest House. Horses welcome. Fenced on two sides.